It wasn't that long ago that we reviewed Supra and QMI's 1200 baud modems. In that article, we noted that modems have really dropped in price as their speed has increased; now that statement seems even more applicable. It appears that 300 baud is now passe, 1200 baud is more or less the new standard and 2400 is on its way to giving 1200 a battle for the top spot. Helping out in that respect is the inexpensive SupraModem 2400. For Atari owners, there are actually two models. 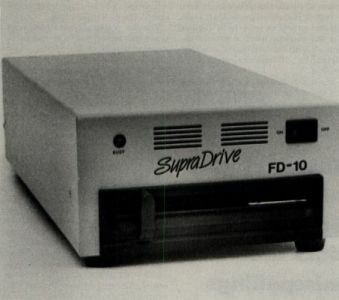 The unit for the ST comes with Supra's own Omega terminal software, and the modem can actually be used on many computers, as the ST utilizes standard IBM cables for hook-up. The 8-bit telecomm crowd gets the same modem, but the package includes the fine, public domain terminal program, Express (with a version of the documentation Supra has cooked up). To connect the modem up to the custom ports on the 8-bit line, Supra also adds in a 13-pin Serial I/O, direct-connect interface. This allows you to daisy-chain it to your other compatible peripherals and avoid the added expense of another interface unit, such as ICD's P:R: Connection or Atari's 850. For this review, we used the ST version, but the modem itself is exactly the same in both configurations, so no performance differences should be noticed. The first realization you get after taking the modem out of the box is its diminutive appearance. It measures 1&inch; by 4&frac58;&inch; by 6½&inch;—not much bigger than two cigarette packs placed side-by-side—and looks to be about half the size of most standard modems. Size has nothing to do with ability though, as the SupraModem is still equipped with many of the indicators and functions of other modems: 8 LEDs that update the status of High Speed operation, Auto Answer enabling, Carrier Detect, Off-Hook condition, Data Reception and Transmission, and Terminal and Modem Readiness; an internal speaker; full-featured dialing capability for Touch-Tone and Pulse; user-definable, yet non-volatile, RAM memory for storing of various data such as an often-used phone number, type of dialing, speaker volume and more; and most importantly, Hayes-compatibility. The last feature is one of the most powerful aspects of telecomputing. From that you can set up the performance of the modem for criteria such as how many rings before modem picks up the line, the amount of time it waits for a dial tone before it starts dialing a number, the status of the speaker and its volume, even activation of certain internal diagnostic tests. These abilities provide you with major league telecomputing muscle, but that also brings with it the potential for confusion and difficulty in learning. Luckily, Supra has coupled the hardware with a decent manual that details how to handle the configuration of the modem. The other benefit of this is the lack of DIP switches anywhere on the modem; it's all taken care of through these internal registers. This alone puts the SupraModem 2400 head and shoulders above some of the other 2400 modems I've seen recently. The other problem I've had with competing modems, whose manuals usually come from the other side of the world and are then translated into English, is the nearly-unreadable quality of documentation—especially given the frequently intense subject matter. Thankfully missing from Supra's does are misspellings and awkward phrases that generally accompany this Godzilla school of technical writing. Actually hooking up the SupraModem is simplicity as well. As tiny as it is, all you have exposed are two modular phone jacks (one for the incoming phone line and the other to connect to a phone), an RS-232 connector passing data between the computer and the modem and a small socket for the power transformer cable. The front panel only contains the eight previously-noted LEDs and a click-on/click-off power switch. You have to give the Supra folks a lot of credit for as compact and well designed a product as they've come up with—which is their own design, as opposed to their self-labeled Avatex 1200. Modem hook-up is simple, operation takes very little getting used to and the price is an incredible value, a trendsetter, to say the least. The only hitch I've found is the modem's dropping a connection when the computer is shut off or reset. There are some times that the program you are running may crash, and losing the link-up can be somewhat annoying. Sometimes this brings with it an ERROR message on the next time you try to dial or use any AT (to get the modems ATtention) command. A call to Supra brought a lack of awareness of the problems (though this has been confirmed by one other SupraModem 2400 user, in their defense it could be a problem limited to some of the first units off the production line), but they promised to look into it and get back to me. This follows along with the standard of support they've provided over the years. All told, the SupraModem is a fantastic deal. For only $219.95—though IVe heard it's been sold in some stores for around $150—you can't find a more enticing bargain. Once again, Supra challenges the marketplace and gives Atari users the next stepping-stone.